The Silentaire 50-TC compressor is made by Silentaire Technology. This company has been producing items for 50 years and has got the reputation as the leading manufacturer of the quiet compressors. The silent operation is not only one redeeming feature of the devices. They are also trouble free, compelling, and reliable. Moreover, the company offers the skilled customer service and technical support. There are several product lines of this brand such as Scorpion, Sil-Air, Super Silent, AMP and DA Oilless Compressors, and the Spectrum 2000 line. 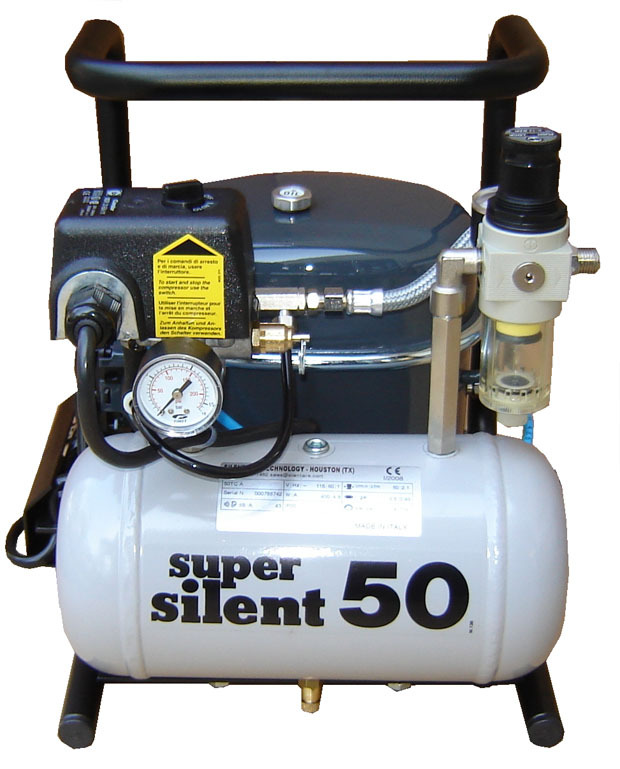 The Silentaire 50-TC model belongs to the Super Silent Compressors as its primary technical feature is quietness. More than that, Super Silent air compressors are powerful, delivering from 1/5 to 1/2 horsepower. Also, they operate at 220 Volt, providing the high pressure level for fast paint spraying. Additionally, these compressors are suitable for many applications like illustration, food decoration, airbrush painting, and so on. The auto shutoff function is valuable because it helps to increase motor life by reducing energy consumption. When the airbrush isn’t used, the auto on/off switch turns off the motor. As a result, heat-related moisture won’t appear inside the compressor. While choosing the air compressor, it is essential to consider the pressure output. The 50-TC model delivers more than 100 PSI, making the spraying smooth and even. It will be helpful in case you need your work to be done as soon as possible. And built-in pressure gauges will show you the pressure level so you can control PSI. Carefully read the User Manual and the Manual Instruction as they contain the information you need to know about parts of the compressor and assembly rules. 13.8" x 13.4" x 11"